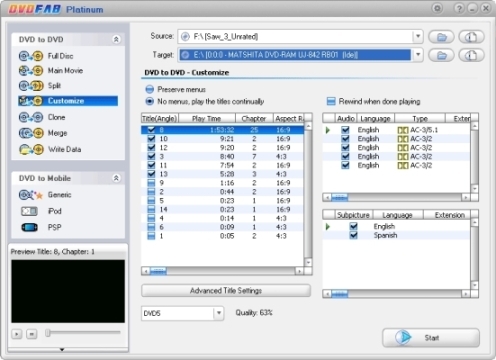 DVDFab is a useful and user-friendly DVD copy software offered by Fengtao Software. This software allows users to copy, convert or burn DVDs in a faster, smarter and easier way. The copying and burning result are of high and satisfactory quality. There are two packages of DVDFab: DVDFab Gold and DVDFab Platinum. DVDFab Platinum offers more features compared to DVDFab Gold. • Added support for Nintendo DS. Users can find the device “nds” in “Generic” mode, and users can create a new option for it in “Settings -> General -> Customize UI”. • Added VOB passthrough extraction. Users can find the device “vob” in “Generic” mode. • Added profile for PVP iAudio X5 and Cellphone LG VX9400. • Fix: Error 400(39…) when copying DVD in certain cases. • Fix: Corrupted DVD data problem when copying “24 Season 5”. DVDFab can run under Windows 98/ME/2000/XP/Vista. For hardware requirement, it needs at least Pentium II 500MHz, 1258MB RAM and 10GB Hardisk.